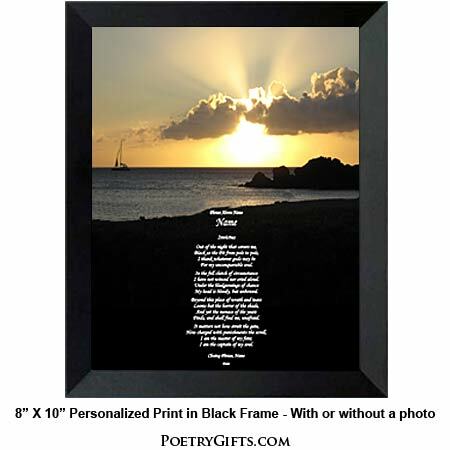 The well known Invictus poem is a great inspirational piece. 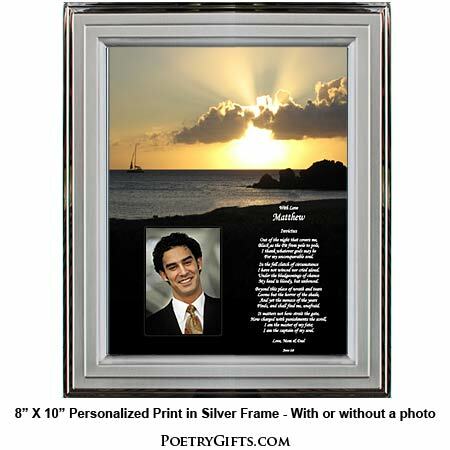 When personalized and framed, it's a perfect inspirational birthday or graduation gift. It can also be given to someone who is starting a new career or business venture. 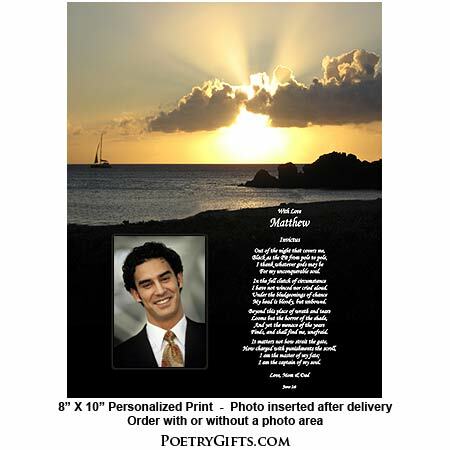 So, if you're looking for a meaningful gift that will encourage and motivate someone you love, the Invictus poem with personalization is it! The poem "Invictus" poem written by William Ernest Henley is filled with so many strong and powerful words including: "I am the master of my fate; I am the captain of my soul." If you know someone who needs a little encouragement or inspiration this would be a thoughtful gift to give them. Maybe your sister, brother, parent, or good friend is dealing with a serious illness and could benefit from these very inspirational words. Or maybe someone you know is having a tough time deciding which career path to take...you want to help but you know it has to be his or her decision. Why not give them a personalized version of Invictus. If you insert a picture of them into the cut-out area of the poem, it's as if the poem was written just for them. He or she will be touched by your thoughtfulness. 3. Closing Phrase and Your Name(s) (as seen after poem) - (Examples: Best of Luck, Mom & Dad; You Can Do It, Jack; Don't Give Up, Adrianna, etc.)" Surprised my son with this poem on the first day of his new job.